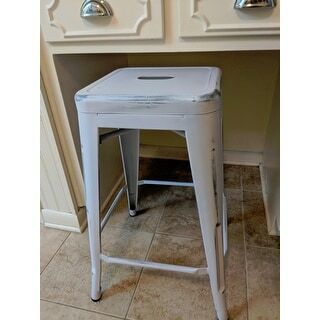 I purchased this stool because I needed something that would fit under my kitchen "desk" area. Most stools I found were too tall, but this one fit under built-in desk perfectly. It is sturdy and looks just like it did online. 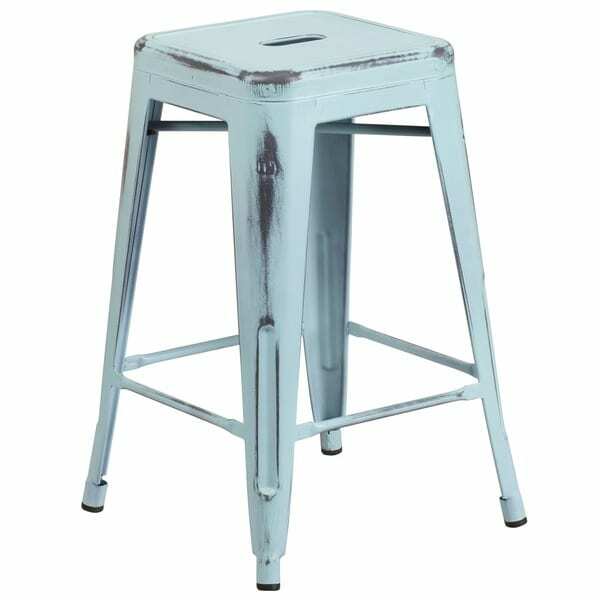 Available in a wide range of colors, this stool features a distressed finish that complements any decor with modern industrial style. The stool is stackable for easy storage, while protective plastic feet prevent damage to flooring. I purchase 3 expensive bar stools. When I put them in my home, I did not like them, so I returned the items. I felt unsure of of purchasing, online, 3 inexpensive bar stools, but couldn't be happier. They arrived quickly. They are very comfortable and look amazing. I bought the red ones. They are "low-key", and perfect for my white kitchen island, as my stove is red. We love the these stools. We have 2 white, 2 light blue, and 2 of the peacock blue. It makes for a very eclectic mix which is what we wanted, but the peacock blue is definitely more turquoise than blue. I ordered these barstools in dark blue. However, they are dark teal, not blue as stated in the description and photo. They seem to be very well made and high quality. The only reason I gave 4 stars instead of 5 was the terrible smell that came with them. They smelled like moth balls or something similar. Not sure if it is the paint or what. I don't know if the smell will dissipate over time, and I am returning them as they are the wrong color. The smell was so odorous that I couldn't have kept them in the house. In fact, as soon as they were delivered I could smell them, and they were still in the box! The stools are great: look real nice, are sturdy and comfy and the color is gorgeous: rusty orange. Packaged really well too. This is exactly as pictured. I wouldn't recommend sitting on them for hours at a time as this is precisely what it looks like, a simple metal stool. That said, the distressed look brings a little vintage charm to any room you put them in. They are counter height, perfect for a kitchen counter, and slide in under the counter to maximize space. These were a great offset to my far more formal family room furniture and really added a touch of charm to my kitchen. I've paired the white and blue chairs together and they look great. A huge bargain compared to other bar stools. I bought the distressed red stools. The red is more like a Chinese red, nice paint with some black variation. Since they are metal, they are kind of hard to sit on. 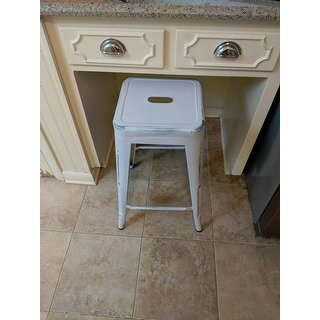 I was able to find stool cushions to fit this particular stool, but unfortunately not on overstock.com which means I may have to wait forever to get them. Perfectly described and much nicer than expected! Very sturdy! Great change in the kitchen! Product was exactly as featured, good quality and price! I ordered 2. The quality is good and they are sturdy, but not as distressed as I thought they would be. I ordered dark blue and you can't see the distressing. Perfect for my industrial/rustic kitchen!!! I bought this stool in yellow and it's perfect. My dining room has grey Tolix chairs so having this copy in the grey and white kitchen fits well and ads a splash of sunny color. The quality is great, as is the price. Use these outside on the patio, easy to clean and comfortable enough. Loved these stools. Unfortunately they seemed to low for the space. Ordered 26" from another manufacturer but the quality was not as good. Wish they were available in 26". The color and picture was exactly what was listed. Love these chairs!!! We have them at our kitchen bar and they are perfect size. You can put them completely under it when not in use for space saving. Color is great as well!!! Love these and are light weight if you need to move to another room for more seating! "The overall dimension is 16 x 16 inches. What is the seat dimension?" "Is the light blue stools really light blue or more of a sea-green-blue..? i got these from a different site but had to return since it didn't look like the picture..."
"How much do they weight?" The stool is 12 pounds. "Is this distressed light blue or does it have an aqua type color blue? This is what it appears to b in the photo. " The closest aqua color we have is a tea.
" , Are the light blue ones more blue blue, or like a light aqua blue? " They're a more aqua blue. "How wide is it on the bottom? I want to make sure my bathroom scale will fit underneath..."